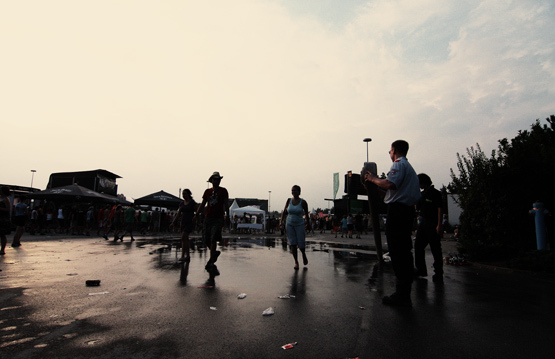 It has been exactly one week, filled with a lot of work, since the FM4 Frequency Festival closed it’s gates in the early morning hours of Sunday, August 23rd 2009. The memories of the few days full of music, hard work and a lot of fun are still very present on my side, and if you wish to wallow in reminiscences as well, I’d love to help you doing so by showing off my personal Best Of Frequency 2009. Hello from St. Pölten. A little teaser. A very warm Good Morning from Frequency Festival in St. Pölten. Just a little note, what to expect here in the next few days. My feet hurt as hell, but it’s only as much hard work as it is pleasure. I shot shows by CJ Ramone, Dúné, Glasvegas, Enter Shikari, Jet, The Ting Tings, AFE, Eagles of Death Metal, Peter Fox, The (International) Noise Conspiracy, Tomte, Thursday, Jarvis Cocker, Little Boots, Bloc Party and Radiohead. So far! Also, I have Polaroid portraits of Kele Okereke from Bloc Party and the nice guys of Polarkreis 18. So far! And, of course, a whole load of photos from around and about and everything. A couple of Radiohead songs from last nights set will be aired on FM4 at 7pm later tonight, make sure you check that out! Play safe, I’ll catch you later.